Ebury Online is a platform that allows users to do international payments quickly, securely and efficiently. Using data analytics it’s an important part of Ebury’s design process. We, as product designers, need to have a great understanding of data in order to make informed decisions that will impact both on the business and the user experience (UX). Services like Google Analytics or Hotjar facilitate the exploration and understanding of how websites are navigated. However, in 2017 and 2018, only 1 in 3 designer-related roles use any experience monitoring tool. At Ebury, we think that data can certainly help us to find answers to questions like ‘who is our audience?’, ‘what do they do?’, ‘how do they perceive and experience the product?’ and ‘how good is that for the business?’. As shown in the image below, data is collected directly from our Online platform using the huha.js library, sent through Segment and shared to different end-points, which will facilitate smart analytics. 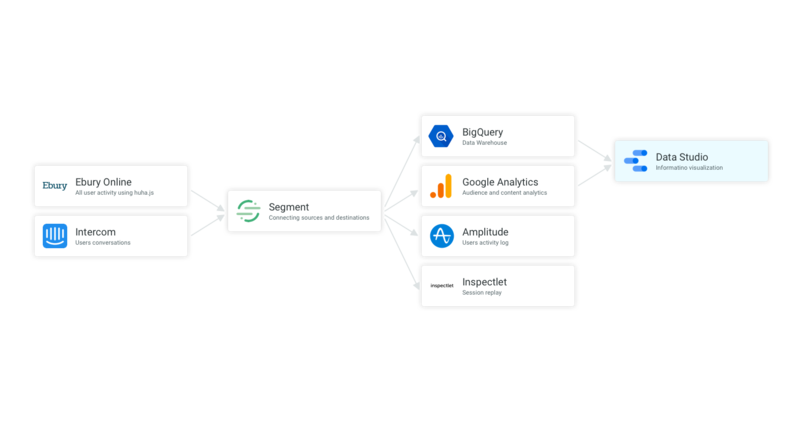 Among all the tools available in the market, we have selected a subset where Google Data Studio plays an important role helping to connect, visualise and share data insights coming from multiple sources, both to monitor and to proactively look for answers. Before jumping into the first dashboard with Data Studio, we need to understand what information will be represented as a User Experience Key Performance Indicator (KPI). We are defining KPIs like Goals, Signals and Metrics, as per the HEART framework which is intended to provide guidance on how to measure through automation the user experience at scale. Adoption measures how many new users interact with your product. It seems fair to consider that this metric is fundamental. But getting new users is as important as keeping them for ‘x’ amount of time. This is called Retention. Both Adoption and Retention represent how successful your product attracts and retain users during a timeframe. The engagement metric measures user interaction. A reasonable ratio will depend on the type of your product. You won’t have the same rates of engagement with a social network app than with a billing platform. Viewing Engagement metrics alongside Adoption and Retention metrics will allow us to compare the level of involvement of new and existing users. The HEART framework defines a metric called Task Success, which we have renamed it to Task Performance.In addition to Results (effectiveness of a task), we have extended it to include efficiency metrics like Time on task, Effort and Errors. We’ll design a dashboard to allow seamless analysis of task performance for different segments and cohorts of users. For example, we can filter down metrics to show task performance of ‘production users based in the UK’ as well as for ‘users who only do payment authorisations’. Happiness is meant to measure user attitudes and perceived satisfaction. We’re measuring happiness based on the result of usability surveys. In the future, we expect to include data from inline feedback forms. The HEART Framework helps us to define easily a set of metrics that will inform our design process. Although metrics about the audience are not part of the initial framework, getting to know how customers are distributed based on different traits such as language, location, or activity time can give us additional information to add context to our data. Defining a relevant framework of user experience metrics is the first step before deciding how to collect and visualise them. In the next post, I’ll share how to use Google Data Studio to create reports and facilitate the data analysis.